Trash To Couture: DIY Festival top from men's shirt. DIY Festival top from men's shirt. create a scoop neckline by removing the collar. 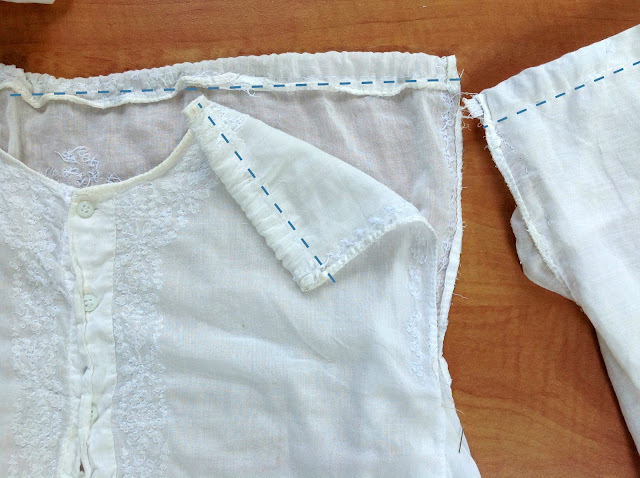 Fold the shoulder seams, back, and sleeves over 1/2" and press. Sew along the raw edge to create a casing. 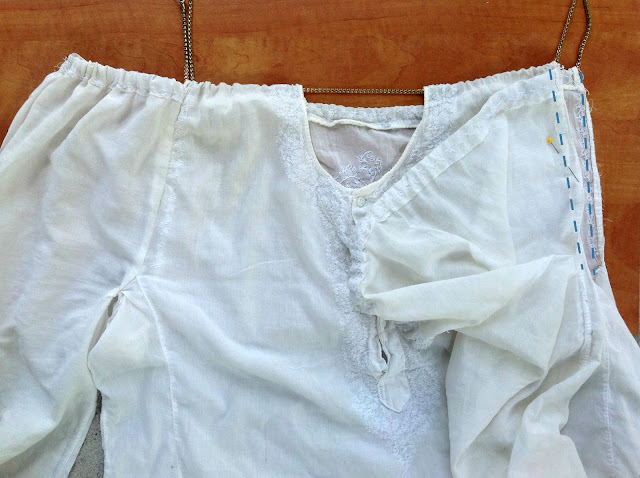 Pull a chain, string or elastic through the fronts and back using safety pin. You will need to adjust length according to your measurements. You will want to then attach the chain or string together to create one continuous loop. I used a set of plier and molded the chain links together. You will cut the side seam of the sleeve as long as you need to fit with ease. This will be the new arm hole and where you will attach to the bodice. Attach the sleeves with the new armhole by sewing right sides together with the bodice, front and back. Tip: you can add elastic to the sleeves if you don't want them to hang to low. Do this before attaching to the bodice. Attach the chain with pliers. Awesome DIY. Might want to cut down on the photo editing. I found it distracting. What does that even mean... ?? I don't see any photo editing except the black arrow on one image and I don't find it distracting. This whole blog is awesome, don't change a thing!! I like it....mayb ill try out for my mother inlaws party. Great idea. Laura... You are fabulous. Ugh. Such a lady!! I absolutely admire you. Welcome to Designer Menswear, a great men's designer clothing store. We sell our own brand of clothes as well as other brands like Hugo Boss, Canada Goose and many more. Don't miss out on any of our deals either!